The numbers waiting for a pass have declined from many hundreds to a few hundred but some people are still unable to enter the secure area despite a wait of 48 and more hours. 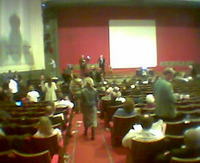 IDS is currently giving a presentation to the auditorium where the 'excluded' are waiting and waiting. He and Simon Edwards of the Believe charity spoke about Conservative ideas for helping young people escape the conveyor belt to crime. Francis Maude has been to the auditorium on, I understand, three occasions to oversee an angry Q&A but IDS' impromptu fringe event was the first 'political meat' for the conference-goers. There are at least 120 people in the holding area (theatre), with many others who are constantly in and out. They are at all levels of the Party - including the Ugandan High Commissioner, A-listers like Philippa Stroud and James Cleverly, and many others who are running stalls and events, and those who are cleared for Parliamentary passes. Checking the ID of those picking up their passes seems to have gone out of the window, which undermines the security issues somewhat! It also seems completely arbritary in terms of who applied when. Francis Maude apparently came back last night to say they would all be sorted out by this morning. This hasn't happened and it certainly seems to have overtaken Labour's conference problems now. I hear 400 passes were cleared last night, and another 400 are left to do. This has sapped the enthusiasm of a lot of people at the start of a conference that was anticipated optimistically. Last night it was compared to an episode of Airline. My own conference pass was processed very speedily but many others are having much less success at getting hold of their passes. This mobile snap was sent to me earlier. 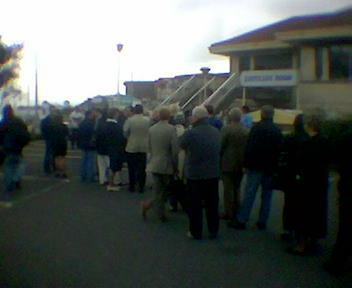 Raffle tickets are being issued to Tories waiting in long queues for access to the conference. It seems impossible for Tories to hold an event without raffle taking place! The misery is being shared across the party. Andrew Lansley was just one MP spotted waiting and waiting and waiting. "I have to admit it to you all, I’m not always organised and today I paid a heavy price for that lax attitude. I had already the paid real price of £120 for the privilege of attending this years conference versus the £55 an organised person would have paid. I was not unduly worried about getting my pass however, late accreditation is not usually a great concern, however awaiting me in Bournemouth was chaos for thousands who, unlike me, had applied in plenty of time and were facing a terrible ordeal ahead of them. In my role as roving reporter however for Conservativehome I was perfectly placed to send in a piece describing conference pass situation. I arrived at the late accreditation queue in relaxed mood, which was quite small, and all seemed normal, however I was directed by an official to the Pavilion Theatre, and my concern grew, and it was the look of panic on the officials faces that got me worried. Once there I encountered another queue and duly joined it, here we waited motionless for half an hour only to be given a raffle ticket and told to sit down in the auditorium. In there I found hundreds of people, whom I quickly discovered were extremely angry and frustrated. I asked an elderly gentleman what number ticket he had in an attempt to ascertain when I would be called forward to the ‘real’ queue. “I don’t have a ticket young man” came back an angry Yorkshire accent, “and I don’t want one.” Oh oh thinks I, things are tense. I set about trying to find out what was going on, and the unfolding story was amazing, many hundreds did not have passes and were awaiting security checks before being given clearance, bizarrely many had applied in time and still didn’t hadn’t been cleared by security despite being regular conference delegates. Alarmingly, people caught up in the log-jam could not get to their hotel if it was in the secure zone and were in complete confusion as to whether they would have a bed to go to tonight. Perhaps most worryingly, many of those who had waited patiently all day were elderly and infirm and looked lost. In an attempt to get some information, I contacted an official and was told to speak to Robert Ashman, and was told to wait. Suddenly whilst waiting for Robert near the ‘real’ queue, a battalion of delegates burst out of the Pavilion and rushed the ‘real’ queue. The official asked them who they were. “Well just do that, wait here.” came the response. I happened to have a lucky ticket, so I trundled along too. Once at the booths my pass was quickly located and that was that! Nothing was different from any other year, except people who were caught up awaiting security clearance were also there and so were moved to the pavilion where there were seats for them to wait, but everyone else was directed along too regardless of whether their passes were waiting for them or not." ConservativeHome recently reported a small decline in Tory membership but a 40% increase in applications to next week's Tory Conference offers a much more enthusiastic indication of the grassroots response to David Cameron's leadership. At this time last year 5,027 conference applications had been made. This year that number is 7,182. CCHQ expects the number might rise to approximately 7,500. 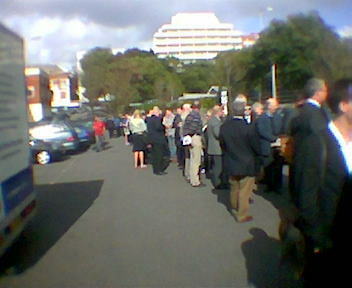 "The Late Accreditation Office is situated in the Lucullus Room, The Pavilion, West Over Road, Bournemouth, BH1 2BU. This is located just below the BIC. Wednesday 4th October 0700 to 1400." CCHQ are pouring extra staff into the processing of applications in order to avoid the four to six hour waits that some delegates to Labour Conference experienced but you'd be advised to get to the office as early as possible.